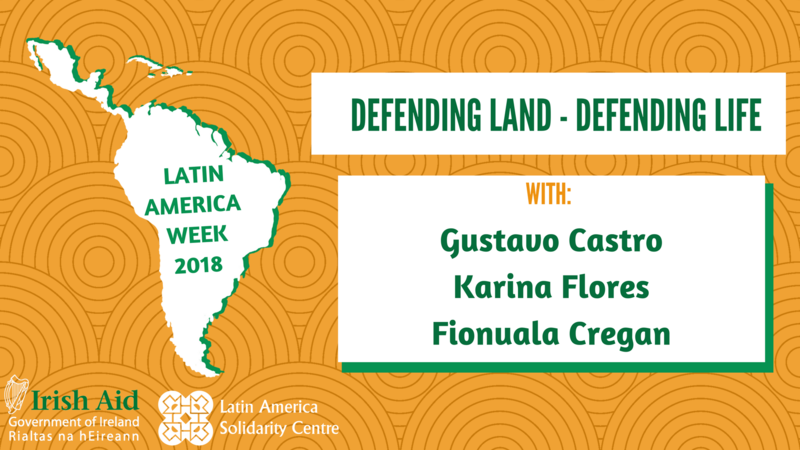 Latin American Week 2018 will commence in Dublin on Saturday, April 7th with a conference focusing on issues of land, forced displacement and human rights in Latin America and Ireland. The issue of access to land is nothing new in the context of Latin America, the region with the most unequal distribution in the world. However the region-wide focus on exploitation of natural resources that has occurred in the past decade – involving oil, mining, logging, agribusiness and hydroelectric energy – have put this issue back to the top of the agenda. In particular the vulnerability of indigenous and peasant communities to being forcibly displaced from communal or ancestral lands has been highlighted by the United Nations, which has accused governments in the region of “trampling” on their collective rights. Individuals, communities and organisations have been subjected to campaigns of state de-legitimisation, criminalization (including the improper application of anti-terror laws), intimidation and violence. Latin America has been described as the most dangerous region in the world for Human Rights and Land Defenders, with countries singled out for criticism including Honduras, Mexico, Brazil and Colombia. LASC’s Latin America Week Conference offer an opportunity to hear the voices of grassroots speakers from Latin America who have experienced this danger first hand. The Conference will also bring together speakers to provide perspectives on the significance of these issues for Ireland and Europe, and offer views on offering solidarity to those defending land and human rights around the globe. Gustavo Castro Soto is a Mexican sociologist who has dedicated his life to the defence of land and the environment. Gustavo is a founder of Otros Mundos and Head of Amigos de la Tierra (Friends of the Earth) Mexico, organisations that are seeking new formulas to protect the environment and promote a more just, equal and peaceful world. Karina Flores is a community leader and activist who has for many years been involved in fighting for Land and Human Rights in Honduras. Karina is a member of the Platform for Social and Popular Movements, and spokesperson for the Mesa Ciudadana de Indignación. Karina has opposed the illegitimate re-election of Juan Orlando Hernández. As a result, she has been victim of hate speech and defamation actions by anonymous groups within Honduras, and has been falsely accused of involvement in drug trafficking and illicit activities. Fionuala Cregan is the coordinator of Land Rights Now – an international campaign to secure the land rights of Indigenous People and local communities. She lived in Latin America for over ten years working on land rights with indigenous communities in Argentina, Paraguay and Bolivia and as a human rights observer in Guatemala. She has an MA in Gender, Development and Anthropology and a Postgraduate diploma in Journalism; and has written for The Irish Times and alternative media outlets such as UpsideDownWorld and Truth Out.